The Bulldogs still have work to do after their first win, a narrow defeat of Old Town Friday night. Madison Area Memorial High School’s 46-42 win over Old Town was the kind of win coaches love. The Bulldogs did a lot of good things and played well, but there were some mistakes that need to be corrected, too. • Mitchell Cushing of Lawrence scored four touchdowns in a 45-22 win over Mt. Blue. • Seth Powers of Lawrence caught six passes for 186 yards and a touchdown. • MCI quarterback Greg Vigue threw a pair of touchdown passes in a 42-6 win over Dexter. • Cody Soucier of Madison scored three touchdowns in a 46-42 win over Old Town. 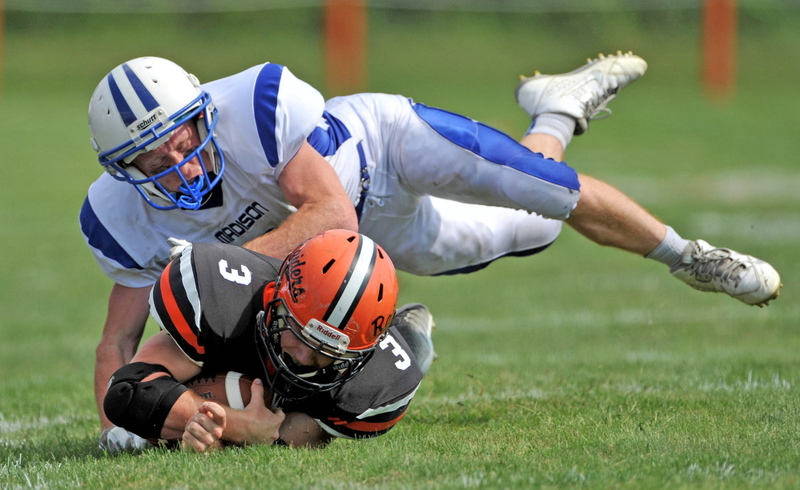 • Messalonskee’s Jake Dexter scored two touchdowns in a 13-7 win over Skowhegan. • Dylan Hapworth ran for 207 yards and a score for Winslow. Madison opened up a 20-0 lead in the first half, and still led 46-28 with just over a minute to play, before the Coyotes scored, recovered an onside kick, and scored again two plays later. “I think my heart skipped a few beats there in the last couple of minutes, but it gives us something to talk about,” Franzose said. “I’m just glad we could just stick it out and beat them,” co-captain Jared Lightbody said. The Bulldogs (1-1) expect to contend for one of the six playoff spots in Eastern Class C this season. The team needs to learn to play with a lead, Franzose said. “We’re not used to being in that situation. We had it a couple years ago at Oceanside, once at Morse. I think we’re going to be in that situation more and find ourselves in competitive games. So now, what do we need to do every single play? It all comes down to execution,” Franzose said. With just over two dozen on the roster, some Madison players are being asked to play a few positions. Madison plays at Nokomis on Saturday afternoon. While Lawrence turned in an all-around strong effort in Friday’s 45-22 win over Mt. Blue, one play worked over and over for the Bulldogs’ offense. Tight end Seth Powers broke free down the middle of the field, catching passes from Cody Martin. Powers caught six passes for 186 yards, including a 21-yard touchdown catch in the second quarter that gave Lawrence the lead for good. The play worked because of something Lawrence saw in the Mt. Blue defense, coach John Hersom said. Lawrence (2-0) plays at Brewer (1-1) on Friday night. Skowhegan fans are asked to wear purple to Friday night’s home opener against Hampden Academy. The purple is a tribute to Skowhegan alumn, booster and parent Brian Michonski, who died earlier this month after a long battle with pancreatic cancer. Purple is the color used to promote pancreatic cancer awareness. T-shirts will be on sale during the game, with proceeds going to pancreatic cancer research. Also, 50-50 proceeds will be donated to pancreatic cancer research. Around the state: Just two weeks into the season, none of 2013’s state champions are undefeated. Defending Class C champ Leavitt lost in week one, and Bonny Eagle (Class A), Cony (Class B) and Oak Hill (Class D) each went down this past weekend, all in close games… Western Class B powerhouse Marshwood has yet to be scored on. The Hawks posted shutout wins over Greely (47-0) and Oceanside (60-0). Marshwood takes on Westbrook next… How even is the Pine Tree Conference Class B division? Six of the league’s nine teams are tied at 1-1.